There are few UK dairies which would be financially successful with only 15 cows, but for one Austrian family, processing and selling their milk has revolutionised their business. Emma Penny visits the Oberascher family to find out more. Ten years ago, Gertraud and Sepp Oberascher ran a very traditional dairy herd on their Austrian farm in a village 25km south east of Salzburg. Their 15 Fleckvieh cows produced milk which was sold to the local dairy company and they worked off-farm to boost their income. But in 2008, interested to see what she could achieve and seeking better returns for the farming business, Gertraud decided to start making cheese with their milk. After a lot of trial and error, the family won an international cheese award in 2011, and a year later the couple, along with their children Christoph, Martine and Andreas, started to build the successful business they have today. Now, the family sells 25 products processed on-farm using milk from their 15 Fleckvieh cows, including butter, yoghurt and 16 different cheeses which are matured from between six weeks and six months. 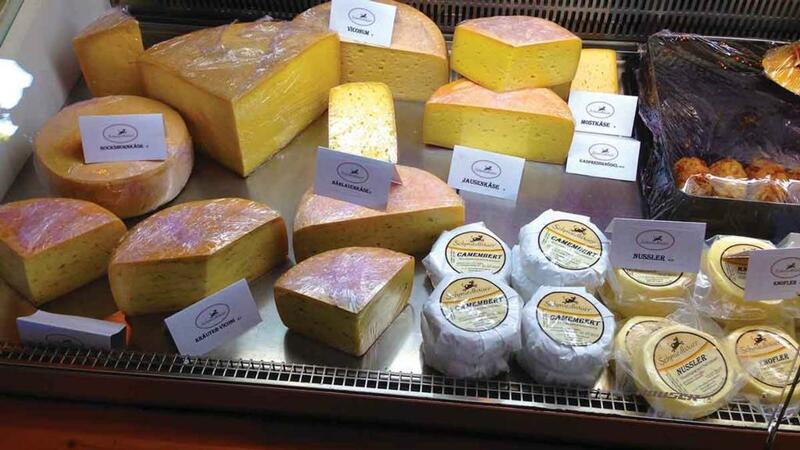 While most of the family’s produce is sold via farmers’ markets, they also sell and run special tasting sessions from their farm shop, which incorporates a state-of-the-art farmyard cheese processing unit. This building, a traditional-looking Austrian alpine cottage, was built by the family using old wood, and sits directly across the road from the dairy, with milk piped underground from the parlour to the processing area. Sepp explains building the factory and shop cost as much as building a ‘normal house’, but they were able to get an EU grant of €32,000 (£28,100), about 16 per cent of the total cost. He explains Austrian customers prefer to buy yoghurt in jars as they believe it tastes better. A 250ml pot of the farm’s natural yoghurt sells for €1.30 (£1.14), of which €0.5 (48p) is a deposit for the jar. This is refunded when customers return empty jars, which are then cleaned and reused. Despite the sizeable financial incentive for customers to return the jars, Sepp says there are still ‘7,000 jars out there somewhere which haven’t come back’. The family attends three farmers’ markets per week, and on those days, the cows’ milk is collected by the local dairy company as the family doesn’t have the capacity to process it. Of the 80,000-100,000kg of milk their cows produce a year, the family processes 50,000-60,000 litres themselves, the remainder being sold to the dairy which pays €0.42/litre (36.9p/litre) specifically for milk produced by cows fed on hay. Processing and selling their dairy products boosts the farm’s returns to about €1.50-€2.50/litre (£1.30-£2.20/litre), though he cautions it is not directly comparable as there is a lot more labour involved with processing and direct selling. Besides processing the milk to start with, at least 30 man-hours a week are required for selling at the three farmers’ markets, but these account for about 60 per cent of sales. All the products come from the Oberascher’s 15 cows, which are barn-housed all year and fed cut grass in spring and summer and hay in the remaining months. The herd calves year-round to provide a constant supply of milk. Sepp says the dairy prefers to buy milk from cows fed hay rather than silage and if the farm was also organic he would receive a milk price of €0.56/litre (49.2p/litre) from the dairy for the proportion of milk it collects. Although he says the farm is ‘close’ to being organic, it would not qualify as there is no uncovered outside area for the cows. This is one of the key measures for qualifying as an organic producer under Austrian rules as many cows are housed all year. The country has, as of December 1, 2016, 1.954 million head of cattle, an increase of 1.1 per cent on the previous six months. Cows are milked in a four-cow side-by-side unit, with milking taking one person about an hour twice a day. 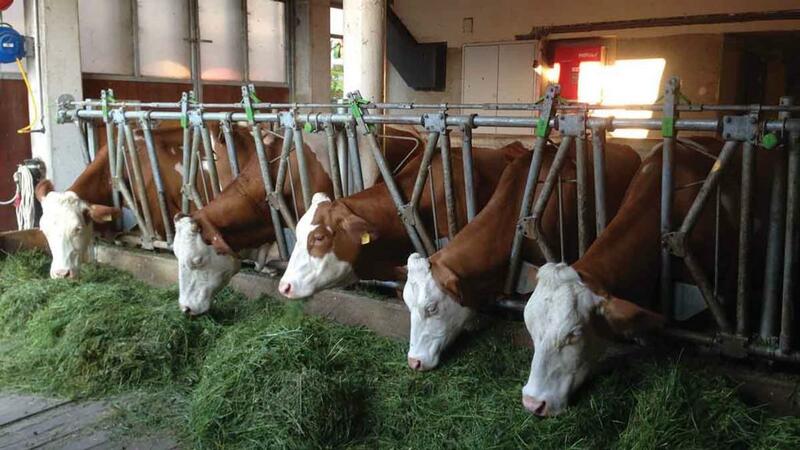 Besides cut grass or hay, cows receive a 2-5kg per day of a compound feed at milking. This must be GM-free, he says. The farm rears all its youngstock, breeding replacements for the dairy herd and selling male calves to other farmers to fatten. Using the Fleckvieh rather than an all-out dairy breed such as a Holstein means male calves fetch a much better price, and cows are tougher. Youngstock are sent to other farmers who have mountain pastures for summer months, costing the family €50-€75 (about £44-£66) for each heifer or calf sent. Heifers are bulled at two years old. With only 12ha (about 30 acres) of grassland and some forestry, the family would like more land, but renting grassland is also expensive, running from €300-€1,100/ha (£264-£966/ha). “There are lots of horse farms and livery yards round here which have people paying monthly livery fees so they can afford these prices. There is a big demand for land and farms suffer,” he says. Despite the difficulties of doing business in an area where land is at such a premium, it is clear processing and selling direct has revolutionised the Oberaschers’ farm. But, with other farms seeing the potential for this, there is now more competition, says Sepp. 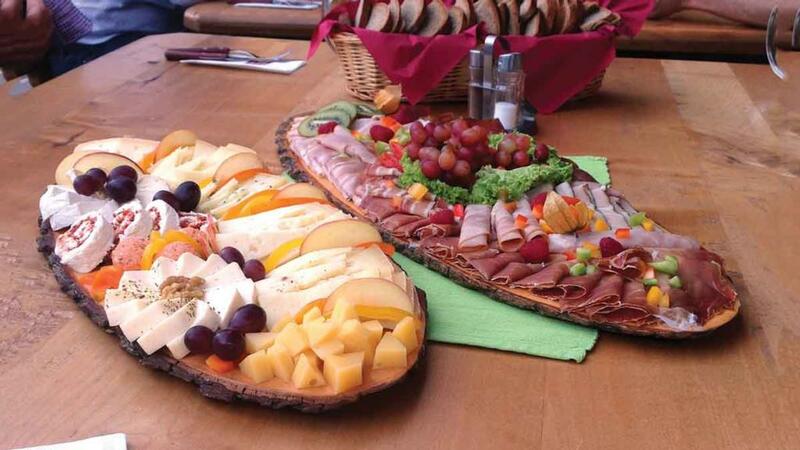 With a recent award from the Austrian Agricultural Chamber for high-quality food production and professional marketing, the family are clearly determined to continue to improve, and to build on Gertraud’s initial enthusiasm for cheese production. 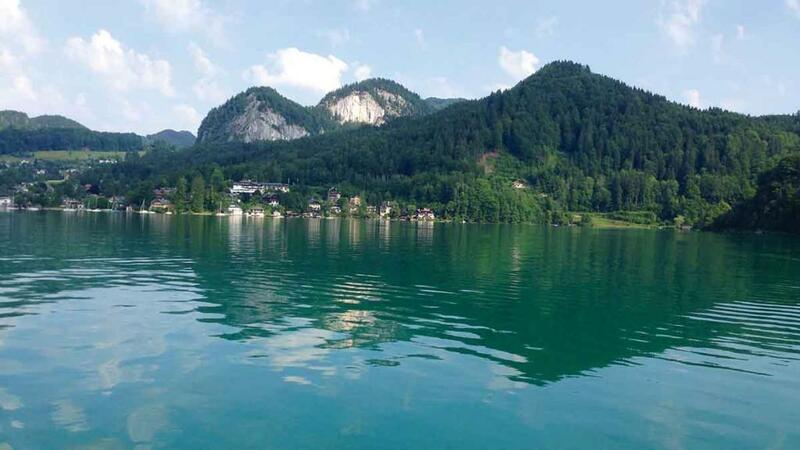 In Austria, payments have been based on historic data, and this is now changing so most farms will receive about €300/ha (€121/acre – £263/ha, or £106/acre) even where they may have received more or less in the past.